and together they are called foci. and then on to point "G"
Put two pins in a board, put a loop of string around them, and insert a pencil into the loop. 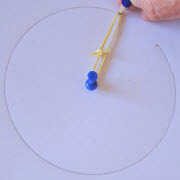 Keep the string stretched so it forms a triangle, and draw a curve ... you will draw an ellipse. It works because the string naturally forces the same distance from pin-to-pencil-to-other-pin. In fact a Circle is an Ellipse, where both foci are at the same point (the center). In other words, a circle is a "special case" of an ellipse. Ellipses Rule! An ellipse is the set of all points on a plane whose distance	from two fixed points F and G add up to a constant. The Major Axis is the longest diameter. It goes from one side of the ellipse, through the center, to the other side, at the widest part of the ellipse. And the Minor Axis is the shortest diameter (at the narrowest part of the ellipse). The Semi-major Axis is half of the Major Axis, and the Semi-minor Axis is half of the Minor Axis. Remember from the top how the distance "f+g" stays the same for an ellipse? Well f+g is equal to the length of the major axis. Area is easy, perimeter is not! where a is the length of the Semi-major Axis, and b is the length of the Semi-minor Axis. Be careful: a and b are from the center outwards (not all the way across). Here is a cool thing: the tangent line has equal angles with the two lines going to each focus! Try bringing the two focus points together (so the ellipse is a circle) ... what do you notice? Have a play with a simple computer model of reflection inside an ellipse. The eccentricity is a measure of how "un-round" the ellipse is.